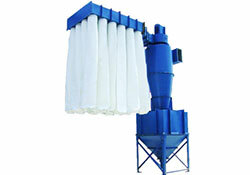 The Cyclone Dust Collectors DYNA FLO are mechanical separators using the principle of centrifugal force to remove solid particles from an air stream. 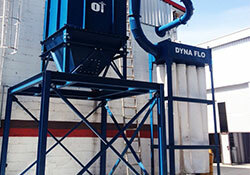 Our cyclones DYNA FLO operate in ranges from 300 to 13.000 CFM (510 to 22.087 m3 / h). Cyclones operate with high separation efficiencies resulting from the high speed input such as from 3.500 to 7.000 fpm (17.8 – 35.6 m / s). In special designs may include longer conical parts, and also high inner spiral entries in the entry region to reduce common turbulence in some designs of similar devices. 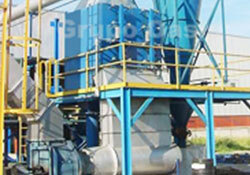 To increase the efficiency We can optionally provide a post filter bags at the fan discharge. Options are provided for the base, including cabinets with drawers, bins, and arrangements for drums of 208 liters.